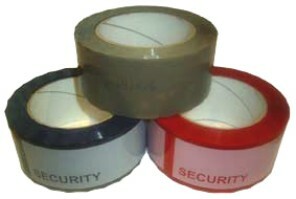 SecuratapeTM is a range of tamper evident security tape or void tape providing a cost effective security solution, for high value or sensitive goods. Ideally used to seal throwaway packaging, such as cardboard boxes, cartons, Jiffy bags, envelopes and even plastic bags or shrink wrap. 4 x standard, off the shelf versions. Blue and Red, 'high visibility', versions feature a sub surface 'security' message and highly visible void message upon removal. Both of the above offer the option of perforations at set lengths to allow tear off sections. Brown version looks like standard packaging tape with void message upon removal. Available with optional sequential numbers and perforations. All versions use high tack adhesive. Jiffy bag & envelope seals. To suit different sealing requirements. Suitable for both deterrent and detection, it allows for a quick visual integrity check from a distance. This allows the option of using individual tear off seals, encouraging economy. Suitable for more discreet security, sequential numbering aids identification and verification. Perforation encourages economy. Transfers void message to carton surface. 50mm width x 50 metres length. Blue : Sub surface 'security' message with high visibility 'void opened' message revealed when tape is removed. Available with or without perforations every 152.4mm. H/S : Sub surface 'security seal' message with high visibility 'void opened' message revealed when tape is removed. This high security version has unique, sub surface, sequential numbers with perforations every 152.4mm. Dry conditions between 10-20ºC (50-68ºF), out of direct sunlight.